Despite the darkness permeating from the White House, glimmers of light emerged this week and the cracks are beginning to show in Trump’s wall. The president just announced a three-week compromise to reopen the government without funding his unnecessary border wall. This is because principled Democrats in Congress demonstrated the leadership, conviction, and resolve required to move our country forward. We started the week by honoring the life and legacy of Dr. Martin Luther King Jr., and were reminded of his timeless words: the arc of the moral universe is long, but it bends toward justice. In November, we voted our values – including our commitment to social justice – and helped Democrats reclaim control of the House. This week, we witnessed the importance of this critically important election. Congress is a co-equal branch of government and an essential check on the White House. Despite Donald Trump’s instinct to rule by decree – and temper tantrum – Speaker Pelosi, Minority Leader Schumer, and Democrats in Congress have made it clear that’s not how democracy works. We agree, and it looks like some Republicans in the Senate and even President Trump are starting to as well. Today, the president realized he must back down because Democrats stood strong in refusing to fund an unnecessary $5.7 billion border wall. 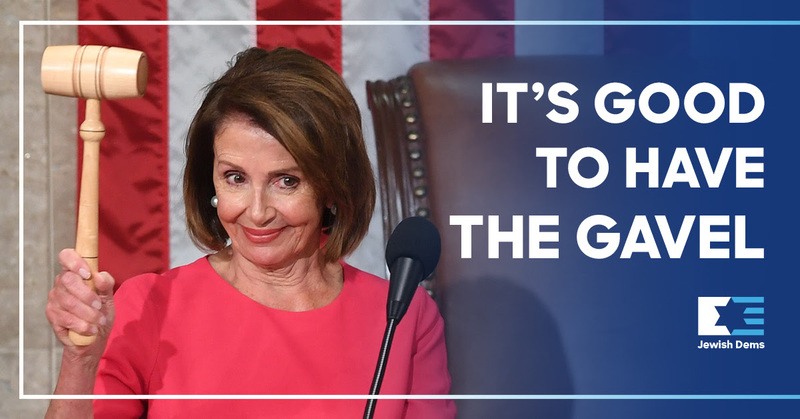 While Democrats support improving border security and will continue to negotiate on this issue, Speaker Pelosi refused to give in to the president’s demands and we applaud her leadership. Our biggest takeaway of the week – it’s good to have the gavel. Read on to learn how you can TAKE ACTION with JDCA, including demanding that Congress reopen the government through the end of the fiscal year without funding Trump’s $5.7 billion border wall. Join the more than 6,000 people who have already signed our petition, which we’ll hand deliver to Senator McConnell next week. Also read on to see the many issues that JDCA has responded to this week in our new section “JDCA SPEAKS OUT.” Finally, please consider supporting JDCA as we continue to advocate for our values. Today is the 35th day of President Trump’s unprecedented government shutdown. Even if Congress immediately votes to reopen the government, 800,000 federal workers will still miss another paycheck and we risk another shutdown crisis in just three weeks unless we continue to ensure our voices are heard. Our national security, as well as the economic and social security of millions of Americans, is increasingly in peril, and JDCA is continuing to take action to demand that Congress reopen the government through the end of the fiscal year without funding Trump’s $5.7 billion border wall. The compromise agreed to today is the same exact deal the president was offered in December. President Trump caved because Democrats stood strong, but we must avoid another shutdown in three weeks. 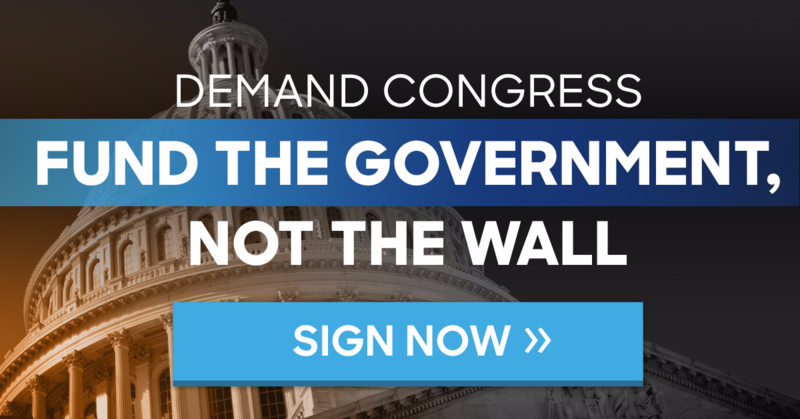 Join us in demanding that Congress fund the government through the end of the fiscal year without funding the wall. We can negotiate on border security but can’t compromise our values. We are thrilled that more than 6,000 of you have already signed our petition, which we plan to hand-deliver to Senate Majority Leader Mitch McConnell next week. Join us by signing below. President Trump’s decision to agree to a short-term compromise to fund the government was largely the result of Speaker Pelosi’s refusal to back down. Earlier this week, Speaker Pelosi demonstrated this leadership when she told the president he would not be delivering a State of the Union (SOTU) address while the government is closed for business. JDCA echoed this message with an equation we hope the president understood: #TRUMPSHUTDOWN = NO SOTU. JDCA commemorated Martin Luther King Jr. by reiterating our commitment to fighting for his unfinished dream of racial, social and economic justice. We must remember Dr. King’s moral vision and commitment to justice every day, and will continue to fight for our values. We will also continue to speak out against racism, anti-Semitism, and discrimination in all its forms. JDCA expressed disappointment with the Supreme Court’s decision to uphold President Trump’s Trans Military Ban, which could mean that nearly 15,000 service members on active duty will be discharged from the U.S. Armed Forces. Our country can and must do better than discriminating against transgender citizens, including those willing to put their lives on the line for our country. The Supreme Court decided this case on a 5-4 vote. Let us not forget that the outcome of this case most likely would have been different had Senate Republicans not stolen a Supreme Court seat in 2016, and subsequently rushed to confirm two justices to the Court. While this week showed us how winning the House has already helped restore checks and balances, it is also a reminder that we must do everything we can to win back the White House and Senate in 2020 in order to ensure that every branch of government reflects our values. This week, President Trump tweeted that he told White House Press Secretary Sarah Sanders “not to bother” with press briefings because he views the coverage of his administration as unfair. We are incredibly grateful to the press for shining a light on this administration – including today’s reports of the sixth indictment of a senior Trump official or advisor implicated for wrongdoing in the 2016 election. The First Amendment must be protected and a president cannot choose “not to bother” with press freedom. It is outrageous that Sarah Sanders has not been to the White House podium since mid-December, and we made our view on this issue clear. JDCA is expanding our team and operations, and we need your ongoing support. We plan to accomplish great things in 2019 and beyond, and look forward to working with you to further our values. JDCA is looking for a Communications Director. If you are interested in applying, or if you know anyone who might be interested, please check out the job posting here.